As of 2018, Randy Moss is the only player from the 1998 NFL Draft to have been inducted into the Professional Football Hall of Fame. ^ Cite error: The named reference Pro Bowler note was invoked but never defined (see the help page). ^ "Peyton Manning Stats - Pro-Football-Reference.com". Pro-Football-Reference.com. 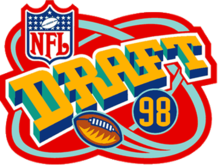 ^ "Colts Wanted Ryan Leaf Over Peyton Manning In 1998 NFL Draft". Sportsgrid.com. 2014-01-21. Retrieved 2018-10-18. ^ "NFL gives Raiders a little extra Compensatory pick at end of first round clears way for K.C. to get McGlockton". baltimoresun.com. 1998-04-18. Retrieved 2018-04-24.